DENVER, March 18, 2019 /PRNewswire/ -- CBD-infused beverages look set to hit the market in a big way in 2019. Integrating these new offerings into wider product lines is accelerating CBD's race for mainstream attention. Youngevity International Inc. (NASDAQ:YGYI) (YGYI Profile) is one of the first to launch, with a CBD coffee coming in May and a CBD water in the works. The Alkaline Water Company Inc. (NASDAQ:WTER) (TSX.V:WTER), which is constantly growing its U.S. distribution network, plans to add a CBD bottled water to its range. The New Age Beverages Corporation (NASDAQ:NBEV) is adding CBD to its line of organic cold coffees and teas. Heineken (OTC:HEINY) has also entered the market by developing a cannabis-infused sparkling water through Lagunitas, its U.S. craft brewer. And the biggest investment in the overall cannabis space has come from Constellation Brands Inc. (NYSE:STZ), which has invested $4 billion in a Canadian cannabis company. In many ways, the popularity of CBD has caught businesses by surprise. Only a few years ago, it was an obscure chemical compound found in cannabis and hemp, not even the part of cannabis that got users high. Now it's a newsworthy growth industry, with CBD products appearing on the shelves of health shops, pharmacists and vaping stores, as well as on dedicated online outlets. The trend has also led to the rise of new companies as well as investment from the likes of Youngevity International Inc. (NASDAQ:YGYI). CBD isn't everywhere yet, but it's feeling close. Though it wasn't predictable, the rise of CBD is easy enough to explain. Since cannabis legalization began in the 1990s, extensive research and development has been conducted regarding the plant. One of the results is a greater understanding of and focus on the range of chemicals found in cannabis, instead of just the high-inducing THC. As researchers started finding and reporting evidence that CBD could be beneficial for health and wellness, a gold rush began. One of the big advantages of CBD, especially for an omnidirectional lifestyle company such as Youngevity, is that it can establish a strong presence in markets that THC can't reach. Shops that don't sell cannabis are sometimes willing to stock CBD-infused products. Some jurisdictions allow the sale of CBD but not cannabis. With the cannabis space gaining momentum, CBD creates a route into that sector with fewer restrictions. This is particularly true because of hemp, a form of cannabis that doesn't contain THC and that the federal government legalized three months ago. CBD can be extracted from hemp, making it a profitable cash crop. A Youngevity subsidiary has recently acquired a 45-acre base in Florida purely for the purpose of meeting the demand for CBD. The U.S. government's widespread legalization of hemp through the passage of the 2018 Farm Bill last December has opened the way for a whole range of CBD endeavors. One of the most popular trends is expected to be CBD beverages. 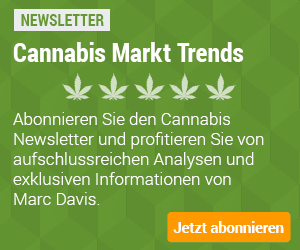 Cannabis: Macht Coca-Cola den größten Fehler?